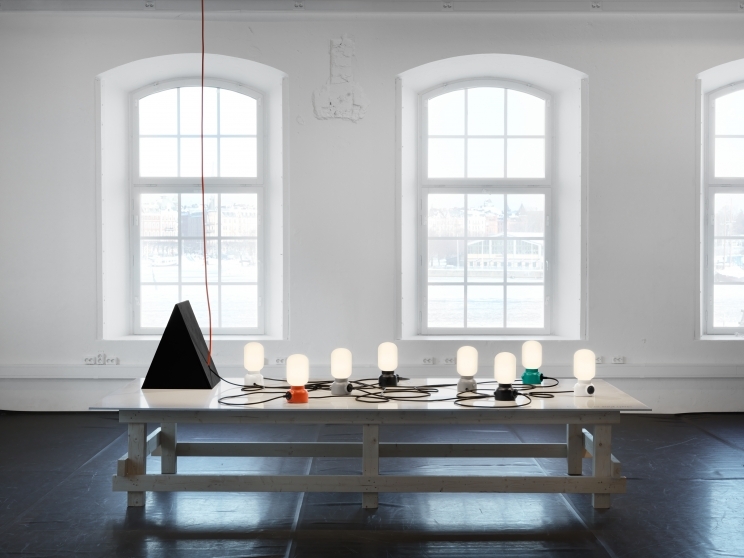 It's about mid-way through the 2012 Stockholm Design Week and I've been traveling to studios, showrooms, and the show floor of the Furniture and Light Fair to seek out what's new in Scandinavian Design. There were plenty of wonderful things out there—far too many to even begin to think about a comprehensive roundup—but in the following slideshow, I share seven of my favorites in lighting, furniture, textiles, and accessories. The brainchild of John Löfgren, Jonas Pettersson, and Petrus Palmér, Form Us With Love began in 2005 just as the three graduated from design school. Their studio has since expanded and they've collaborated with some of the biggest companies in Sweden and have honored that relationship by highlighting them in the "Form Us With Friends" exhibition. One of the five featured collaborations (in addition to Silestone, Design House Stockholm, Abstracta, and One Nordic) is with lighting company Ateljé Lyktan. The team launched this glass and powder-coated aluminum lamp which features a plug in its base to create an additional power outlet. Clever. The guest of honor at the fair is designer Inga Sempé. While she lives and works in Paris, she often collaborates with Scandinavian manufacturers, including Wästberg. This dimmabe LED pendant light (the w103c) can be hung in a variety of ways, including from a hexagonal rail system. Furniture for public spaces has been a recent interest of mine, and one designer that does a lot of work in the realm is Thomas Bernstrand's Share chair for Nola. The nesting seats lock together and coin operated. Once a user is finished, they return the chair to its place and receive their deposit. I visited his studio in Södermalm and he explained that the design is intended for smaller urban spaces that often get cluttered by moveable furniture. The contrast between bright colors of petal-like pattern on the Lune curtain by Pia Holm for Almedahls was quite stunning. The fabric was slightly transparent, allowing some light to shine through. This design was part of the new "Plant a Seed of Form and Function" collection, which gleans inspiration from botanical silhouettes (and modernist cliche sayings, apparently). While the company indicates that this is meant for public settings, I think it would suit residential applications just fine. I loved the Darjeeling tea trolley by Swedish designer Anna Kraitz for Källemo. Bright color and blonde wood—you can't get much more Scando than that. This set of interlocking steel trays by Clara Von Zweigbergk for HAY was another favorite. The color palette and ability to create patterns was what drew me to the product, but I realized that using it for its intended purpose, to organize things, would cover the attribute that I liked most. Jesper Ståhl designed this sideboard for Abstracta. The ratios of the doors are all based on the module of an A4 piece of paper. This year, the company launched a new plum iteration, though I prefer the white.